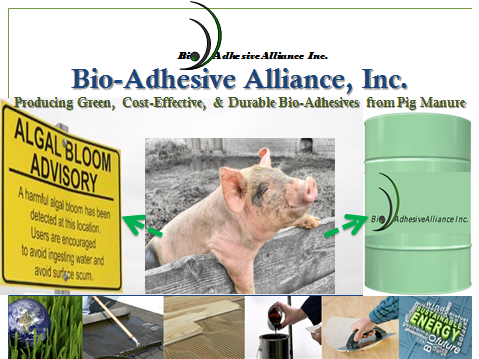 Bioadhesive Alliance Inc. is a developer and manufacturer of “PiGrid”, bio-based adhesive that is green, low cost, and durable and can be utilized as a substitute to petroleum-based asphalt binder. PiGrid is a sustainable alternative resource developed from the thermochemical liquefaction process converting swine manure to a biobinder while sequestering carbon and greenhouse gases otherwise released into the atmosphere. The conversion process reforms the organic matter in swine manure into oil with heat and pressure in an anoxic, aqueous environment. PiGrid primarily consists of asphaltenes and resins which rheological and chemical properties are similar to that of petroleum-based asphalt binder used in asphalt pavement. PiGrid’s bio-adhesive competitive advantage as an environmentally beneficial alternative and sustainable resource for petroleum-asphalt binder is it (1) provides the pavement industry a lower production cost and an enhanced performance product, and (2) provides a solution for hog producers, governments, and trade associations looking for appropriate solutions for waste management from traditional swine waste decomposition lagoon designs. Bioadhesive Alliance is the grand prize winner of the ACC Clean Energy Challenge.